Trion Joins the Ranks of Compromised Databases #Rift – Nomadic Gamers, eh! It seems that these emails are becoming the norm, compromised databases in games that we all know and love. 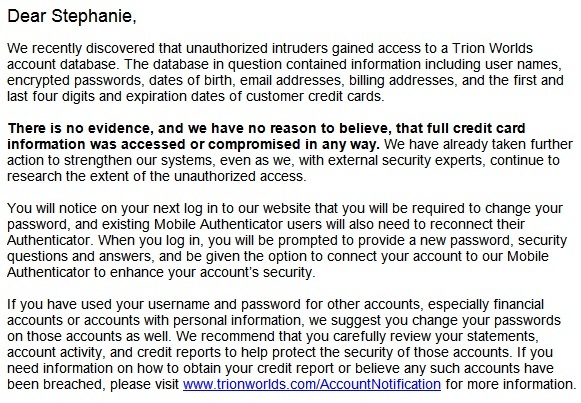 Trion sent this out last night with a promise of 3 days of free game play, and a ‘moneyags’ purse’ which increases the amount of coin looted by 10% as long as you update your password and security questions. I have a little piece of mind since I have no credit card on file with Trion, I’ve used paypal for all of my transactions. While paypal is not immune to being hacked, I do feel a little more ‘secure’ with them, because there are far larger fish in that sea than little ‘ol me. Still, it’s a bit uncomfortable to know that personal information is in someone else’ hands, someone who was never intended to have it. When we fill out this information about ourselves to these game companies we trust them to keep it safe. I always wonder what the purpose of someone gaining access to this information is. Do they actually do anything with the data they’ve obtained or is it just a show of ‘hey look what I can do’ and to put some fear into companies and their subscribers. While I personally don’t think this is any reason to run from the hills screaming (after all, it’s not the first time this has happened) I’m sure there will be plenty of cries of outrage. I hope everyone gets their personal information changed without any hassle and things go smooth from here on out.